Radiant heat has become a popular home heating solution nowadays. With the emphasis on clean, renewable heating sources, radiant heat has become one of the most popular home heating solutions nowadays – from heating floors to radiant snow melting systems and heated driveways. Radiant heat involves the transfer of energy that radiates heat outward from its source. A radiant floor heating system features a heating element embedded beneath the floor to efficiently heat the floor as well as objects in contact with the floor. Ultimately, the systems warm the air in the room from the ground up. A wide variety of proven floor heating systems that can be installed under just about any type of floor surface is available on Warmzone.com. There are two basic methods for providing radiant heat – electric systems and hydronic systems. Electric radiant heating systems utilize a network of electrical resistance heat cable (heating element) that is embedded under the floor surface. 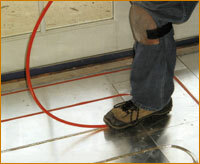 Hydronic systems pump specially treated water through flexible Pex tubing under the floor. The liquid is re-circulated in a closed loop system between the network of tubing and the boiler. Both types of radiant floor heating systems provide a much more efficient means of heating than that of traditional forced air systems. 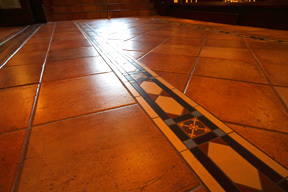 Another advantage of radiant heated floors is that the systems consist of "zones" that can be controlled individually. This gives you the flexibility to heat only the specific rooms or areas that you choose. A small, programmable thermostat with an external or built-in sensor is used to control each zone. Electric floor heating systems utilize heat cable to generate the heat source. When in operation, energy is forced through a conductive material (heat cable) to create resistance (heat). For most areas an electric line-voltage system is used. The heated floor system's thermostat has an integrated GFCI breaker at the power source to ensure safety, and is available in 110 or 220 voltage. The line-voltage products most recommended are ComfortTile and Warmzone Prodesso and SlabHeat (In-Slab) cables. Low-voltage systems use the same voltages and consume the same amount of power as line-voltage products. The main difference is the use of a step-down transformer which reduces the voltage supplied to the heating materials. Due to their low-voltage current (8-30v), heating elements like FloorHeat can be safely nailed and stapled down to secure the product to the floor and are therefore useful for installation under hardwood and carpet. 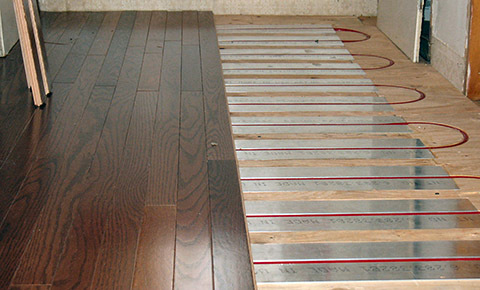 One of the most recommended low-voltage radiant heat products we recommend is STEP FloorHeat. In hydronic floor heating systems, specially treated water is heated by a boiler and then pumped through a closed loop series of special PEX tubing that is installed under the floor. The heated liquid produces warmth that radiates across the floor's surface. Hydronic underfloor heating is still the most popular form of radiant heat, mainly because it has been around the longest. Hydronic heating was first used by the Romans thousands of years ago, but naturally, there have been significant developments since. In the most recent hydronic floor heating systems, PEX radiant tubing is routed in the grooves of aluminum RAUPANELS™ (shown left). RAUPANELS are recommended as the most effective hydronic underlayment system because of the aluminum's reflective properties and light weight. The RAUPANEL floor heating system is designed to provide rapid response, optimal performance and ease of installation. This effective floor heating system is an excellent alternative to joist heating and poured thermal mass applications. The RAUPANEL system consists of 3/8-inch RAUPEX pipe, extruded aluminum panels for strength, and wood return bends. The aluminum panels offer high conductivity with a low profile and a low mass, and eliminate the need for structural reinforcement. RAUPANEL systems are easy to install, and require less job site preparation and installation time. While electric heated floors are often recommended over hydronic systems, there is still a place for hydronic floor heating and snow melting applications. Hydronic radiant heat is frequently used for large commercial radiant heat applications because the operational cost can be slightly less than that of electric radiant heating systems, depending on local utility rates. Different thermostats are available to control your radiant floor floor heating system. You can choose a thermostat that is controlled by a floor sensor (to measure floor temperature) or opt for one with an ambient sensor that measures the actual temperature in a specific room. Radiant heat can be used as a primary source of heat for your home (or business) or used as a supplemental heating source that complements your conventional heating system.